BAYLINER Bow Rider/Deck Boat. 21.5 feet, Inboard/Outboard, 5.0/305 Chevrolet Engine. Comes With Dual Axle Trailer. Perform As They Should With No Problems. The Compressing is 190-185 On All Cylinders. The Boat Has Not Been Used That Much. Portia-Potty Area Which Is Enclosed. Comes with a Stainless Steel Propeller. Also comes with a new Bimini Top, and a new Marine am/fm cd 100 watt Radio. We have not had any problems with the Boat and has always performed excellent. The Date On The Camera. 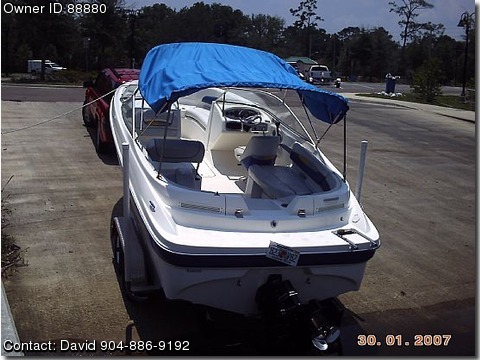 Call At : (904) 886-9192, 521-9009, or email back at: seabear74@hotmail.com – THE BOAT HAS BEEN USED IN FRESH WATER.